Bodifine takes you on a path of discovery with beautiful and exciting body jewellery designs. 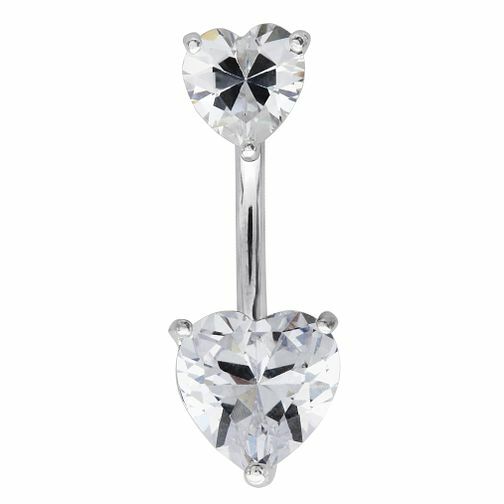 This single belly bar, created in silver tone stainless steel, features an adorable double cubic zirconia heart design to add accents of luxurious sparkle and quality to any style. Bodifine Stainless Steel Heart Cubic Zirconia Belly Bar is rated 3.5 out of 5 by 4. Rated 3 out of 5 by Anonymous from Not for me. When I ordered this belly bar I thought it would be more discreet than it was, but both love heart stones are quite large so I exchanged it for a smaller bar and the assistants in store were great and more than happy to help. They organised a refund on the spot and sorted an exchange with a product in store.